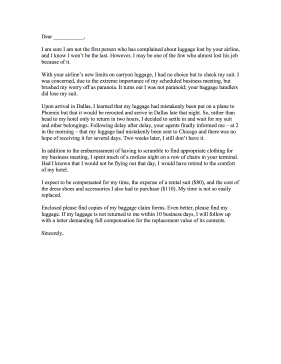 A sample scenario is constructed to illustrate poor airline luggage service in this complaint letter. I am sure I am not the first person who has complained about luggage lost by your airline, and I know I won't be the last. However, I may be one of the few who almost lost his job because of it. With your airline's new limits on carryon luggage, I had no choice but to check my suit. I was concerned, due to the extreme importance of my scheduled business meeting, but brushed my worry off as paranoia. It turns out I was not paranoid; your baggage handlers did lose my suit. Upon arrival in Dallas, I learned that my luggage had mistakenly been put on a plane to Phoenix but that it would be rerouted and arrive in Dallas late that night. So, rather than head to my hotel only to return in two hours, I decided to settle in and wait for my suit and other belongings. Following delay after delay, your agents finally informed me - at 2 in the morning - that my luggage had mistakenly been sent to Chicago and there was no hope of receiving it for several days. Two weeks later, I still don't have it. In addition to the embarrassment of having to scramble to find appropriate clothing for my business meeting, I spent much of a restless night on a row of chairs in your terminal. Had I known that I would not be flying out that day, I would have retired to the comfort of my hotel. I expect to be compensated for my time, the expense of a rental suit ($80), and the cost of the dress shoes and accessories I also had to purchase ($110). My time is not so easily replaced. Enclosed please find copies of my baggage claim forms. Even better, please find my luggage. If my luggage is not returned to me within 10 business days, I will follow up with a letter demanding full compensation for the replacement value of its contents.